How to Play – The How-To Repository for the Cigar Box Guitar Movement! Shane Speal shows you how to play Albert King’s Born Under a Bad Sign on 3-string Open GDG slide guitar. Learn now to play both the melody and chords for Amazing Grace on 3-string Open GDG Cigar Box Guitars. This tablature will show you exactly how to play the melody and chords for the hymn Amazing Grace on 4-string cigar box guitars tuned to Open G GDGB. The tablature in the PDF link below will show you exactly how to play the bass line for the timeless spiritual tune “Amazing Grace“. Learn how to play America the Beautiful on your 3-string Open GDG Cigar Box Guitar! Presented here are two versions of the melody, each in a different key, as well as a version that includes chords. The tablature in the PDF link below will show you exactly how to play the popular American patriotic song “America The Beautiful“, the lyrics for which were written by Kathie Lee Bates and music by Samuel Ward. “Apache” is an instrumental piece written in 1960 by Jerry Lordan. Since it’s inception it has been recorded by numerous artists over the years, including; The incredible Bonjo Band, The Shadows and The Sugarhill Gang. Learn how to play Ashokan Farewell, a popular Americana tune written by Jay Ungar. The tablature in the PDF link below will show you exactly how to play a tune full of loss and longing called “Ashokan Farewell“, written by Jay Ungar. This is the the popular Scottish New Year’s celebration song Auld Lang Syne, as arranged and tabbed by Glenn Watt. This is the the popular Scottish New Year’s celebration song “Auld Lang Syne“, as arranged and tabbed by Glenn Watt. The tablature in the article will show you exactly how to play the melody and chords for the American patriotic classic, “Ballad Of The Green Berets“. 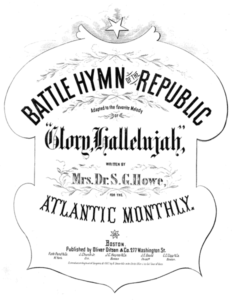 “Battle Hymn of the Republic” or “Mine Eyes Have Seen the Glory” was written by Julia Ward Howe during the first year of the American Civil War. Like many Folk songs of the time, the music was appropriated from another classic folk song, “John Brown’s Body”. Click the image above to download the print-able PDF. 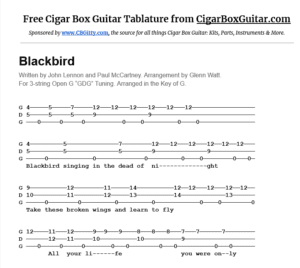 The tablature in the PDF link below will show you exactly how to play the classic rock song “Blackbird“, written by Paul McCartney and John Lennon and recorded by The Beatles. This tablature is arranged for 3-string Open G “GDG” tuning. Click on the image above to download the printable PDF document. All of the cigar box guitar tablature here on CigarBoxGuitar.com is presented by C. B. Gitty Crafter Supply, your one-stop shop for all things Cigar Box Guitar: Instruments, Kits, Parts, Gear & More.